A lot of people associate quinoa with: hippies, vegans, health nuts, food fads. And I suppose it has risen pretty steeply in popularity recently. 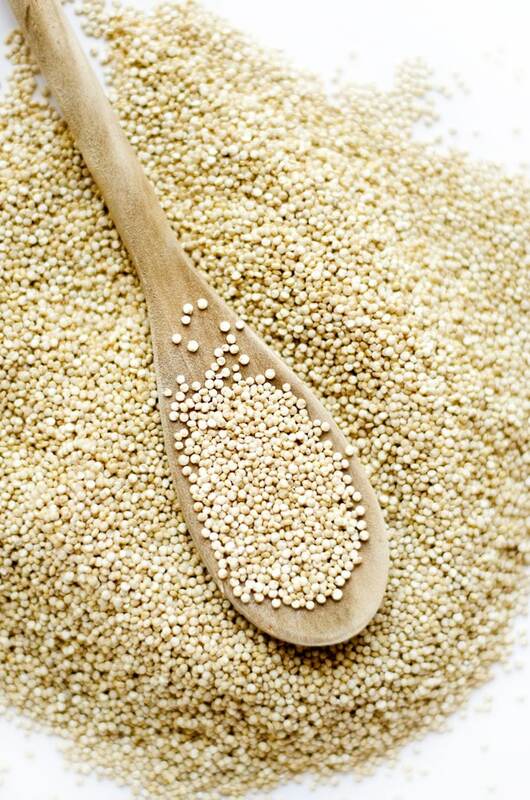 Heck, 2013 was named the International Year of Quinoa by the Food and Agriculture Organization. But quinoa goes way back thousands of years and is worth working into your diet. Quinoa originates in the Andean Regions of Peru and Bolivia where it adapted to grow under some un-bolivia-ble conditions (I had to). High altitudes, extreme temperatures, droughts…quinoa is one tough seed! Yes, a seed. While we like to treat quinoa like a grain in cooking, it actually contains no grain at all. 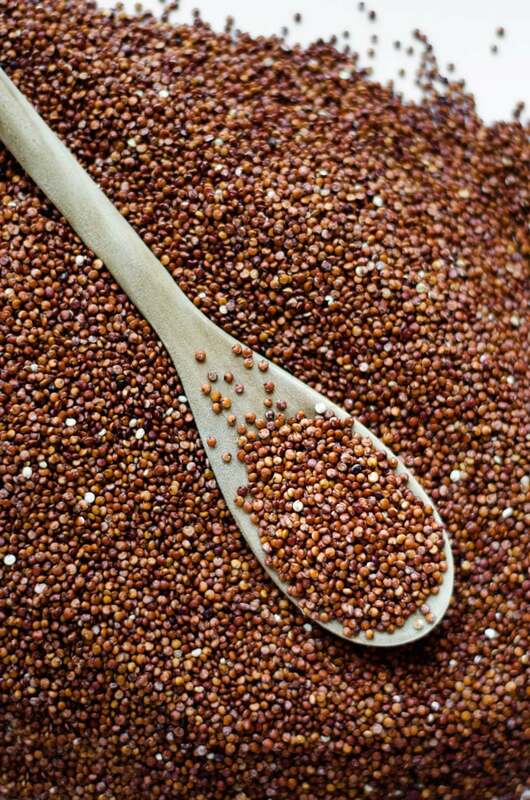 The quinoa seed comes from a plant in the same family as spinach and chard. It’s more closely related to beets than it is to wheat! And because it isn’t wheat, it’s got a lot of different (awesome) qualities. It cooks faster for one, an always-important characteristic for the inpatient cook as myself. It’s also super nutritious. I usually hesitate throwing around that name “superfood”, but it comes close to what one might define as a superfood. Skip to the bottom of the page to read up on all of quinoa’s nutritional goodness. You can find quinoa in most groceries, usually near the rices or flours, or in the health food section. There are a million and one different kinds of quinoa, but you’ll find three main kinds in your grocery. Black: sweeter, earthier, bolder (but also fresh out of stock at my grocery so you won’t see it pictured here. Just imagine normal quinoa but like…black). Rinse quinoa. Unless your package says “pre-rinsed”, the quinoa will still have saponin, a natural bitter substance, on it. Bring water to a boil. Use 2 parts water to 1 part quinoa. Once the water is boiling, add quinoa and a sprinkle of salt. Reduce heat to a simmer and cook 10 to 15 minutes, or until all the water is absorbed. Use a broth (like vegetable or chicken) instead of water. Toast quinoa seeds before boiling them. Heat a touch of oil in a skillet, then cook the quinoa seeds for about 5 minutes until lightly browned. Thanks to the Maillard Reaction this will give it a nice, nutty, toasty flavor. 87% DV of Manganese: A trace element that plays a role in healthy brain and nervous system function. 42% DV of Magnesium: A mineral that plays a large role in bone formation and maintenance in addition to being a part of over 300 reactions within the body. 39% DV of Phosphorus: A mineral that works with calcium to form calcium phosphate, the foundation of bones and teeth. Also plays a role in energy metabolism as part of ATP (adenosine triphosphate). 34% DV of Folate (Vitamin B9): A water-soluble vitamin that helps make DNA & RNA and metabolize amino acids. 21% DV of Iron: A major component of hemoglobin, the proteins that make up red blood cells and carry oxygen around the body. This is a non-heme source, meaning it does not come from an animal. It is not absorbed as well as heme iron. 20% DV of Vitamin B6 (Pyridoxine): A water-soluble vitamin that works behind the scenes as a coenzyme in many important reactions within your body, including protein metabolism and red blood cell formation, among countless other functions. 20% DV of Thiamin (Vitamin B1): A water-soluble vitamin that turns your food (carbohydrates) into fuel (glucose). People at risk for deficiency include those with Crohn’s Disease, alcoholics, and those undergoing kidney dialysis. 16% DV of Zinc: A mineral important in strengthening your immune system, healing wounds, and maintaining your sense of taste and smell. 16% DV of Riboflavin (Vitamin B2): A water-soluble vitamin that acts as a component of FAD to help your body break down macronutrients in the electron transport chain, creating usable energy. 10% DV of Vitamin E (a.k.a Tocopherols and Tocotrienols): A fat-soluble antioxidant that fights against potentially damaging free radicals (molecules with unshared electrons that float around wreaking havoc) from reacting with oxygen when fat is metabolized. A complete protein: Contains all 9 essential amino acids (the amino acids you need to obtain from food because your body cannot make them).